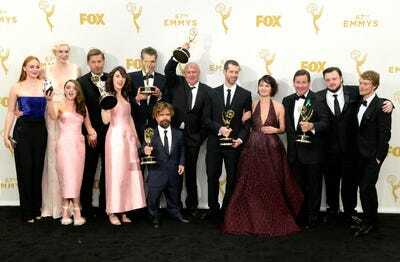 Kevork Djansezian/ Getty ImagesThe cast of ‘Game of Thrones’ at the 67th annual Primetime Emmy Awards. However, the negotiations do not guarantee that all five actors’ characters will survive through the end of the series. The last salary negotiations for the quintet took place in October 2014 and landed them each $300,000 per episode. That 2014 deal put the “Game of Thrones” actors among the highest-paid actors on cable TV, according to The Hollywood Reporter. Even the new negotiations still are nowhere near the deals “The Big Bang Theory” actors Jim Parsons, Johnny Galecki and Kaley Cuoco have scored — each earns $1 million per episode just like the entire cast of “Friends” did for the show’s final seasons. Though actors on broadcast networks also typically earn more than their cable counterparts. A seventh season of “Game of Thrones” is confirmed while the eighth season is still just a possibility. Showrunners David Benioff and D.B. Weiss have said they have “between 70 and 75 hours before the credits roll for the last time.” At the end of the sixth season, “Game of Thrones” will have aired 60 hours over six seasons. This could mean the final seasons will each have less episodes than normal.